I always like making the traditional versions of my favorite classics, but I’m game for a bit of a switch-up, too. Reinvention using seasonal ingredients is actually the theme for the second Cupcake Round-Up, co-hosted by two cupcake bakers extraordinaire: Garrett of Vanilla Garlic and Cheryl of Cupcake Bakeshop. Inspired by a packet of raspberries in the fridge, I thought the flavors of a linezrtorte would translate well into a cupcake. I admit I’m a little confused about seasonality here in Australia. Things that I would never think I would find at certain times of the year pop up in the framers’ market unexpectedly. And some things, like rhubarb, seem to be widely available year-round. I have started to see Aussie raspberries, while still outrageously priced (I’ve had to get used to the fact that produce in general is much more expensive here than in the US), being sold for about half the super-outrageous price they were sold for a couple of months ago. Based on cost, I have decided that raspberries must at least be coming into season (it is almost summer here). I haven’t had a fresh raspberry since I moved here nine months ago, so I bought a packet. 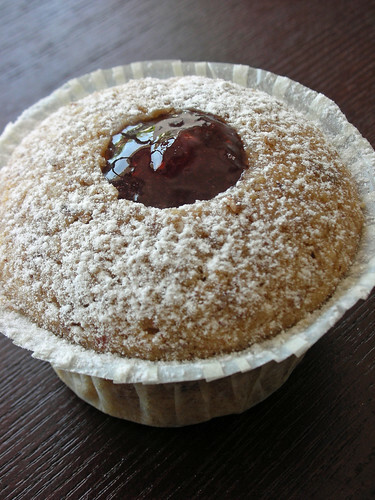 I began my little linzer cuppies with a recipe for hazelnut cake from Gina DePalma, pastry chef of the excellent Babbo Restaruant in Manhattan. As written below, I tweaked it a bit to incorporate some of the other flavors found in a linzertorte (and to use up some sour cream I had in the fridge), but if you want Chef DePalma’s original recipe, you can find it here on Babbo’s website. The recipe, originally for a single 8″ round, makes twelve perfect cupcakes…I was so pleased. I made sure they stayed moist with a little douse of simple syrup and filled them with fresh raspberries. Topped off with raspberry buttercream and garnished with more fresh berries and candied hazelnuts, they were every bit as good as the real thing, and without any fussy lattice work or soft dough. Note: If you don’t have seedless raspberry jam for this recipe, just press jam with seeds through a strainer to remove. Or if you want the seeds, use seeded jam instead. -Start with a batch of simple syrup (recipe below). -Bake the hazelnut cupcakes (recipe below). Lightly brush warm cupcakes with simple syrup, then cool completely. -Make and cool the candied hazelnut garnish (recipe below). -Make the raspberry buttercream (recipe below). -Prep the fresh raspberries. Depending on size, estimate 3 or 4 raspberries for filling each cupcake, plus extras for decoration. Loosen few tablespoons (or as much as needed to coat your berries) of raspberry jam with a squirt of lemon juice. Toss the raspberries into the jam, turning them to coat. Keep them whole– try not to smash them up. -To fill the cupcakes, use a small knife or round cookie cutter to cut a plug out of the center of each (going in from the top). Save the top bit of each plug. Spoon a small amount (about 1/4 teaspoon) of simple syrup into each cavity. This is just to keep the cakes moist…don’t drown them. Put a few jammy raspberries into each cavity. Cover with the top bit so the filling is not exposed. 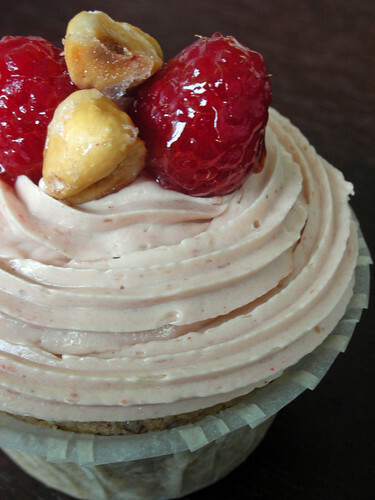 -Top with buttercream and garnish with candied hazelnuts and jam-coated raspberries. -Bring just to a full boil, at which point all the sugar should be dissolved. Shut off heat. -Transfer to a jar or airtight plastic container for storage. This will keep in the refrigerator for weeks. Note: If you can’t find hazelnut flour in stores, you can make your own by toasting 1 cup of skinned hazelnuts for five minutes in a 350°F oven. Cool them completely and pulse them along with 1/4 cup all-purpose flour in the food processor until finely ground but not pasty. Substitute this mixture for the hazelnut flour in the recipe and only use 1 cup of all purpose flour when proceeding with the third step (as the extra 1/4 cup is already accounted for in your hazelnut flour mixture). -Preheat the oven to 325°F. Line your cupcake tin with paper liners. -In a small bowl or liquid measuring cup, lightly whisk together the eggs and sour cream. -In the bowl of an electric mixer, cream together the butter and the sugar until very light. Beat in the spices and lemon zest first, followed by the hazelnut paste or hazelnut butter. Then gradually add the egg and sour cream mixture. Scrape down the sides with a rubber spatula and beat in the vanilla extract. In a small bowl, mix together the hazelnut flour, all-purpose flour, salt and baking powder. Beat the dry ingredients into the batter until just combined. -Divide the batter evenly among the cupcake liners. Bake for 25 to 30 minutes, or until a cake tester inserted in the center comes out clean. Allow the cupcakes to cool in the tin for 10 minutes. Lightly brush tops with simple syrup while still warm. Then gently remove from the tin and cool completely on a rack. -Pop hazelnuts in half by sticking the tip of a small sharp pairing knife into the tops of each one. -Toss them with enough simple syrup to lightly coat (just to make shiny). -Turn them into a small sheet pan or baking dish, keeping them in a single layer. Bake just until golden and simple syrup hardens, about 10 minutes. -When cool enough to handle, separate them so they don’t stick together and cool completely. -Bring a few inches of water to a simmer in a medium saucepot. In the bowl of a standing mixer, whisk together the eggs, sugar, vanilla and a pinch of salt. Set the bowl over the simmering water (making a double boiler). Whisk gently but constantly until the mixture reaches 160°F. It should be thin and foamy. -Transfer the bowl to the mixer and whip until light, airy and room temperature. This should take about five minutes. Reduce the speed and whip in the butter, piece by piece. If it looks curdled halfway through, it should come together as you add the remaining butter. -Once all the butter is incorporated, beat on high speed for about a minute until light and fluffy. Add the raspberry jam and cinnamon and beat until just incorporated. You can refrigerate, covered, for up to five days. Simply gorgeous cupcakes, and I love that you adapted a traditionally big cake into a more compact package. The perfect way to think of a cupcake! These sound & look lovely! Wow they are just so delicious looking. One day when i have lot of spare time then i am going to try and make this. I love linzertorte, and you’ve made such a gorgeous interpretation! Beautiful! I am Australian and have lived here all my life and still can not accept that even in the height of summer you pay more than $5 a punnet for some pretty average raspberries. It sometimes drives me to such a point of distraction I imagine moving somewhere and starting my own raspberry farm. Tragic I know. I love these – they look delicious and just the thought of a raspberry buttercream makes me swoon. Could you please share with me your choice of cupcake papers/holders that I see in most of your choices here..are they easy to peel away from the cake? Teresa- For the cupcakes in this post, I used “french pleated” cupcake papers from the Donna Hay Home Collection. I don’t know your location, but they are probably hard to find outside Australia. Here in Sydney, I bought them at David Jones department store. They are easy to peel away. Thanks for your question. You need to be living in the right location for cheaper raspberries as they don’t grow everywhere… in Tassie they are cheap, even better though, grow your own, I have had several kilos from just 2 plants – great value for $. 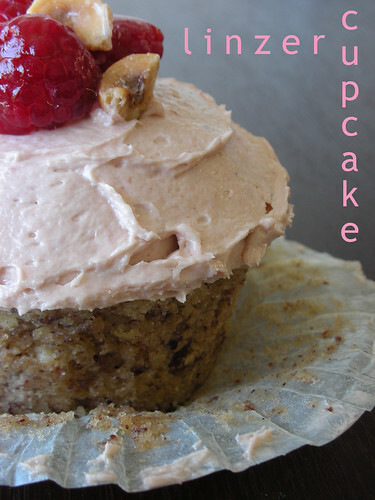 I made these hazelnut cupcakes last night (with a few substitutions) and they were delicious!! Thanks for the recipe!